Ready to get S&OP working for you? See how to configure SAP Integrated Business Planning to fit your organization, from master data types to planning levels. Then execute demand planning, perform unconstrained or constrained supply planning, and consolidate the results into views with step-by-step instructions. Get more out of your new SAP IBP implementation with what-if scenarios, KPIs, dashboards, and built-in integrations. Get step-by-step instructions for your essential S&OP tasks. Use historical data to create a statistical model during demand planning, propagate demand and supply through rough-cut capacity planning, and use the S&OP optimizer for constrained supply planning. 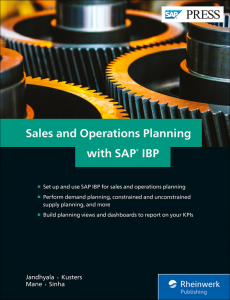 From running simulations to building planning views, see how SAP IBP takes your S&OP calculations to the next level. Monitor the effectiveness of your sales and operations plan with performance monitoring and advanced analytics. Walk through the global settings, master data, and key figures for setting up SAP IBP for sales and operations. See how to get data from SAP ERP, SAP S/4HANA, and other systems into SAP IBP. Raghav Jandhyala is a senior director of product management at SAP for SAP Integrated Business Planning. He is responsible for sales and operations planning, unified planning processes, and best practices in SAP IBP. Raghav has more than 16 years of experience in different fields, including supply chain management, retail, and banking, along with strong technical background in development and adoption of business applications. Previously in his career, Raghav worked as a business consultant, development architect, customer success and solutions manager, and product manager. Raghav has worked with SAP IBP from its inception and is responsible for developing the roadmap for SAP IBP for sales and operations. Currently, he works with multiple SAP IBP customers on new innovations, business transformations initiatives, and as a trusted advisor for their global rollouts. Jeroen Kusters is a senior manager for Deloitte Consulting LLP with more than 10 years of supply chain planning experience. Jeroen started his career implementing SAP APO environments, with a focus on demand planning and service parts planning. Since 2013, his focus has been on SAP Integrated Business Planning; he works closely with SAP to drive new functionality enabling best-practice supply chain planning business processes. Pramod Mane is a senior director of product management at SAP for SAP Integrated Business Planning. He has more than 17 years of supply chain planning experience. At SAP he is responsible for the roadmap and direction for supply chain planning applications covering sales and operations planning (S&OP) and business network collaboration.Pramod was part of the initial product development team for SAP Sales and Operations Planning on SAP HANA. Pramod works closely with customers and partners to drive innovation and has acted as a trusted advisor to many customers during their supply chain transformation journey. Pramod started his career at JDA Software where he was part of the supply chain product development team; he later implemented these solutions as part of a professional services group. Pramod holds a BS in mechanical engineering from the University of Pune (India), a MS in industrial engineering from SUNY Buffalo, and an MBA from the University of Maryland, College Park. Amit Sinha is a leader in SAP supply chain practices at Deloitte Consulting LLP. He has more than 14 years of experience in supply chain planning and business transformation projects. He has worked extensively with different industry sectors across the globe in the areas of sales and operations planning, demand planning, supply planning, inventory optimization, and supply chain analytics. He is an expert in SAP IBP and other SAP supply chain applications. Amit has also authored a text book on supply chain management, published numerous articles in international journals, and has been a speaker at supply chain conferences. If you want to download this e-book, please click on the cover image. You will be redirected to sap-press.com, the only website that sells SAP PRESS e-books. Don’t worry, if you prefer to hold your book the print version is also available for purchase.